LeBleu's History - Website of lebleuslanding! Deep in the southwest corner of Louisiana lies a region famed in American history as the “Neutral Strip.” This forty-mile-wide stretch of wilderness and marsh land, principally in present-day Calcasieu and Cameron parishes, became a geographic entity in 1806 when the boundary between Spanish Texas and the United States was in dispute. In that year, the “Neutral Ground Agreement” established the “Neutral Strip” which was left unoccupied by troops and law enforcement officials of either nation. This agreement remained in effect until 1821. Although a few legitimate land hunters settled there, the Strip soon became notorious for harboring the lawless elements and social outcasts of two nations. Bounded on the west by the Sabine River and on the east by the Calcasieu, the region is noted for its many deep, cypress-lined and moss-draped bayous, its marshy lowlands, and live oak-studded cheniers in the coastal or southern sector, and for its pine forests and hardwood bottomlands in the northern sector. By 1820, only a sprinkling of white settlers and slaves were living there along with small bands of the fast-vanishing Attakapas tribe, led by Chief Calcasieu (Quelqueshue meaning Crying Eagle). Bartheleme Blaise LeBleu was the first white settler to build a permanent residence in the Calcasieu region. The LeBleus are considered the premier pioneer family of Southwest Louisiana. LeBleu and his family found a way to prosper from the resources they found in the area. His parents, Louis LeBleu and Marie Gentils were immigrants from Bordeaux, France. Bartheleme was born in 1722 at Arkansas Post along the upper Mississippi River. During his years on the Mississippi, he learned the river and coastal areas and became a pilot. He lived in New Orleans for a time, but headed west after his marriage to Marie Josette de la Mirande in 1769. He started westward in a two-wheeled bullock cart and crossed the Calcasieu River several months later. Arriving at the shore of Lake Charles and finding it impossible to ford, he turned back, settling about six miles east of the lake along what is now called English Bayou. Bartheleme and Marie settled and had six children. The two eldest, Arsene and Catherine, became deeply embedded in the lore surrounding the early history of Lake Charles. Arsene LeBleu was the first white man born in the Calcasieu area on October 30, 1789. In his younger years, LeBleu was a buccaneer, sailing against the Spanish as one of Jean Laffite’s captains. By 1815 LeBleu had built his home at a point where the Calcasieu River intersected the Opelousas Trail and Old Spanish Trail in the area now known as LeBleu Settlement. He was among the largest land holders in southwest Louisiana. His home was a spacious cypress house, covered with plaster and attractive painted murals on the smooth walls. LeBleu’s stock, numbering in the thousands, grazed the Calcasieu prairie southward below his home located on the upper reaches of English Bayou. He drove his herds from Texas to New Orleans and his home became a well-known way station, or “stand,” for the Texas cattle drivers along the Opelousas Trail. Cattle “stands’ were operated in Louisiana, giving the drovers access to cattle pens, lodging at night, and warm food. This way of life afforded him the opportunity to meet many people. Some of his friends included James and Resin Bowie. They were such good friends that Resin was named “Parain” or godfather of his son Arsene Jr. 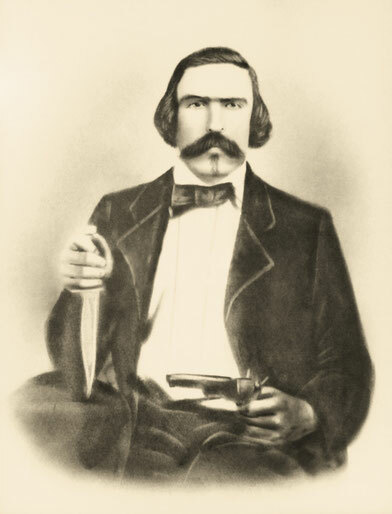 While James (Jim) is more famous for killing a man with the bowie knife, most people don’t realize it was his brother Resin that designed the famous blade. The early inhabitants of the Neutral Strip held Jean Lafitte in high esteem and he reciprocated by showering them with luxuries rarely seen on the frontier. Laffite was considered a war hero rather than an outlaw due to his help in defending New Orleans during the Battle of New Orleans. In his journal, Lafitte made many references to the Neutral Strip and its residents. 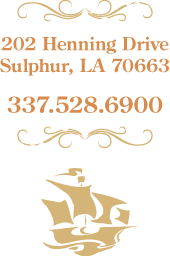 The Lebleu family furnished his crews with beef and vegetables when their ships were in the Calcasieu River. It was their descendants who have perpetuated the legendry of Jean Lafitte in Calcasieu Parish. Laffite made his Louisiana headquarters with his good friend LeBleu, spending many days at his home with the family. Arsene, whom Laffite called “My Captain,” always welcomed Laffite and his men into the LeBleu home on English Bayou. LeBleu built a “double-pen” log house, for storage of Laffite’s silks, spices, teas, liquor, jewels, and other contraband. This building stood the wear and tear of many years, but was finally destroyed by the hurricane of August, 1918. It was rumored that Lafitte hid some of his treasure there. “Part of my merchandise was unloaded at the mouth of the Calcasieu, in the care of Mr. Arsene LeBleu,” Laffite wrote. Once, when LeBleu admired a diamond stud Laffite was wearing in his silk shirt, Laffite unscrewed the gem and tossed it to LeBleu, remarking that he’d better keep it as it was much too beautiful for a rough pirate privateer. Legend says Lafitte spent a lifetime in love with a woman that couldn’t be his, the sister of his best friend Arsene. Charles became jealous of Laffite and accused Catherine of being too friendly with the handsome buccaneer. One day, shortly after the birth of their sixth child, Charles returned home from a business trip to find her wearing a brooch given to her by Lafitte. Raging at Catherine, he drew a pistol and shot her. When she fell to the floor, Charles assumed she was dead and hastily exited the home. Story is told that news of the shooting was sent to Arsene and Lafitte and they made chase. Sallier was never heard from again. Catherine survived and found that the bullet had hit her hand and then the brooch that she was wearing. The brooch kept the bullet from penetrating her body and saved her life. Catherine lived on at Shell Beach until she died at the age of 75. She never remarried, and most people believe that she was innocent of Charles’ accusation. Handed down from generation to generation, the family still has this amethyst brooch and there are creases where it was struck by the bullet. Arsene was instrumental in organizing and establishing government in Calcasieu. In 1840, the state legislature created “Imperial” Calcasieu Parish out of some 5,000 square miles of wilderness. Formerly part of St. Landry parish, its population barely exceeded 2,000. Arsene organized the first police jury elected in Imperial Calcasieu Parish and held the first meeting in his home on August 24, 1840. Shortly after the census of 1850, Arsene LeBleu left his home in Louisiana to join the Gold Rush. He made his way to California and was never heard from again until they learned of his death. He died in Sacramento on October 17, 1850 leaving a lasting legacy in Louisiana.